Editor's note: Celebrate Japan's Star Festival: Storytelling, Origami and Tanabata Decorations at Japan Society on Sunday, July 13, 2014 at 2 pm. Every year on July 7th, Japan celebrates a special holiday known as the Star Festival or Tanbata. On this day, people write their wishes on colorful strips of paper called tanzaku. 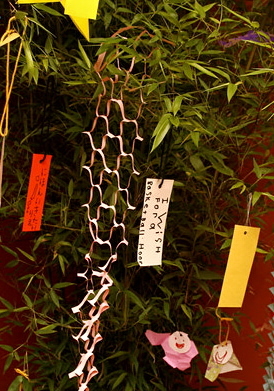 After writing their wishes, people hang their tanzaku on bamboo branches. Origami designs are also occasionally placed on the bamboo branches in order to enrich the display. In a sense, this is the summer-version of the typical Christmas tree. 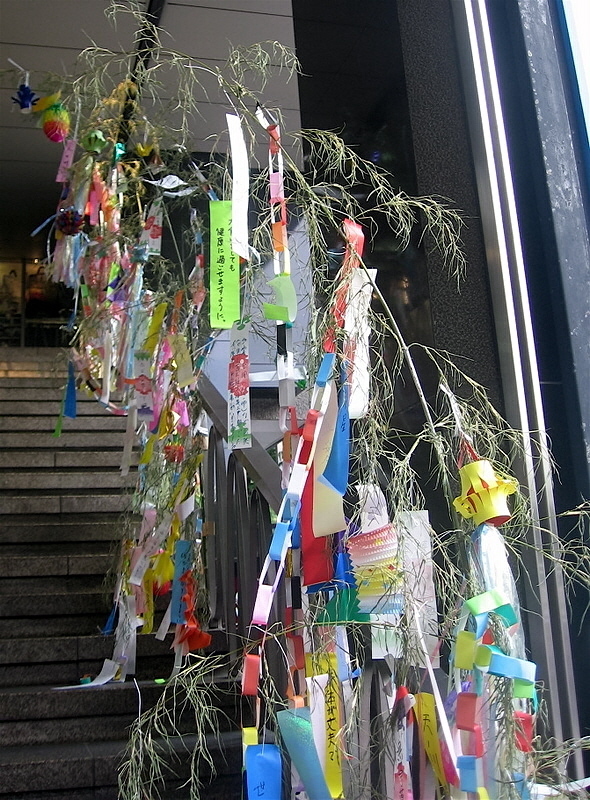 Among the wide variety of tanabata decorations, the colorful streamers stand out the most. The bright streamers represent the weaving of threads which relates right back to the Tanabata story itself (told below). There is also a cast net decoration that symbolizes luck in fishing, which translates into prosperity. The Tanabata originated from the ancient and tragic Chinese tale, Kikkoden. The legend is over 2000 years old now. Long ago, there was a beautiful weaver princess named Orihime who lived high up in the skies. She was the proud daughter of the Heaven God. Everyday, she would diligently weave cloth for her father. But soon, her father began to worry that she was working too hard, and he decided to introduce her to a young cow herder Hikoboshi. It was love at first sight-- the two immediately fell in love. Love-sick, they forgot all about their duties. The cows became ill and the cloth remained unwoven. Angry, the Heaven God decided to separate the two by the River in Heaven/The Milky Way. The two were no longer allowed to see one another; this was their severe punishment. Devastated by this truth, Orihime continued to weep all day. Seeing this made the Heaven God finally change his mind. The two were given permission to see each other once again, but there was a trick. They could only meet once a year, on the seventh day of the seventh month (seven being thought to be the lucky number). But if it rained, the river would flood and the two would not be able to see each other. Therefore, the two would always pray for good weather and if they met successfully, then everyone who made a wish on that day would have their wishes come true. The Star Festival was transmitted to Japan during the feudal era. Combined with traditional local customs, it became an official event at the Imperial court. Commoners soon began observing the festival and would develop distinctive ways of celebrating this day. In July, many Japanese cities hold festivals celebrating this holiday and the streets become dressed in beautiful dazzling decorations. Without doubt, this is an enjoyable day to visit in Japan. Tanabata decorations outside a Japanese elementary school. Photo taken 2008 by Britt Williams. Students will be exposed to an important Japanese holiday. 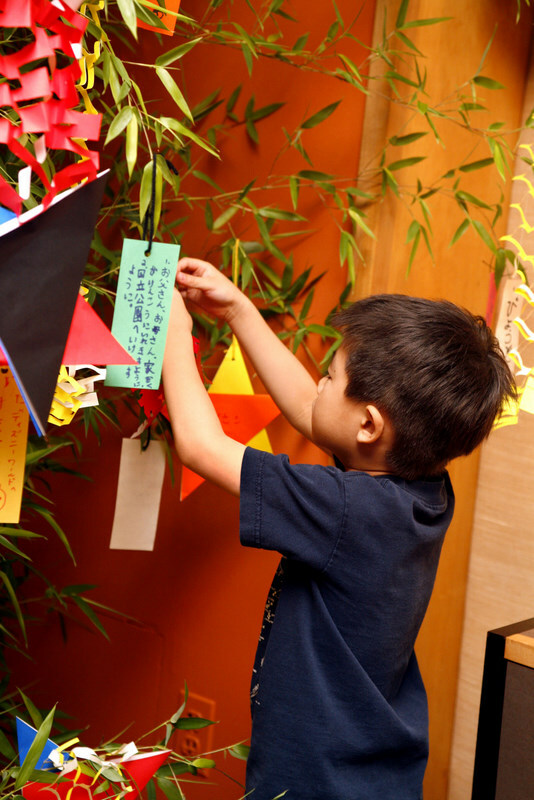 Students will experience and learn the Tanabata tradition. Understand the importance of Tanabata, a well-known Japanese holiday, and celebrate it in the classroom. Does the Star Festival remind you of any other holidays? Tell students the story of Hikoboshi and Orihime. Begin by having the students make their own tanzakus. Cut colorful construction paper into rectangles, approximately 6 x 1.5 inches. Punch a hole in the top of the paper. This is so that some string or thread can be passed through the holes which then allows for the tanzakus to be hung on the bamboo. Examples of tanzaku and milky way. Hand out the tanzakus to each student and have them write their own personal wishes. Cut a long piece of thread or yarn and pull it through the hole in the tanzaku. Tie a knot at the very end. Usually, these tanzakus are hung on green bamboo branches, but because bamboo branches are not available in the typical classrooms, it may be a fun idea to hang these from the ceiling instead. The colorful tanzakus would make a very attractive classroom! Next, the students can try folding origami stars and milky-ways. The milky-ways involve some scissor-cutting while the stars are easy to make, but require some glue. For instructions on making origami stars and origami milky-ways, please see the Origami Club website. Students share their wishes with one another. Then, have them discuss the story of Hikoboshi and Orihime. Was it a happy story? Was it a sad story? Why does Tanabata even exist in the first place? Make sure they still remember the importance of Tanabata even at the very end. Resources. Storybook: Reynolds, Betty. Japanese Celebrations: Cherry Blossoms, Lanterns and Stars!. Vermont: Tuttle Publishing, 2006. This colorful books covers many Japanese festivals, including Tanabata. For more children's literature: Bibliography of Children's Books about Japan was compiled in 2000 by the Education Department at Japan Society. It is designed to assist elementary teachers and librarians in choosing high-quality children's literature about Japan. Along with an article identifying key points to look for when evaluating Japanese children's literature and an introduction to kamisihbai (Japanese storytelling), the extensive annotated bibliography recommends specific stories, songs and poetry and offers a brief summary and suggestions for classroom use for each. Please note that stories published after 2000 have not been included in this bibliography. Origami Resources: Origami Club (www.origami-club.com/en/) has instructions for Tanabata origami listed under "Star Festival." Additional resources: This photo shows a final project made by elementary students in Japan about Orihime and Hikoboshi. As is typical in the Japanese curriculum, the project involves literacy, math, and art.